Having the opportunity this year to attend NAMM, that is the National Association of Music Merchants Incorporated, show, in Anaheim, California, I decided to take a very selective approach and set off on a quest for a professional-quality, tiny, electronic drum set, that can be played with sticks. Briefly, I feel that the current trend to make electronic drums almost as big as the acoustic drums and cymbals that they represent, is missing the point. One great advantage of triggering samples or synthesis is you can have an enormous kit represented by a very compact array of triggers. And to me, this makes much more sense. Prior to the show, I was in the position of having tried most or all available options, usually by buying, trying, and reselling, but occasionally by accepting the hospitality of, and messing around in, the local music store. So I have owned or played almost all of the currently and formerly available compact one-piece controllers by Roland, Yamaha, Alesis, KAT, and Alternate Mode. My quest was, and is, to find a good compact array, with nice sounds, and also to find a playable kick trigger and pedal arrangement that is not bigger than the whole kit beneath which it sits. Were my expectations realistic? Let’s start on the floor. 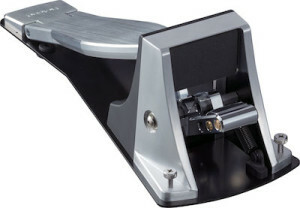 Most kick triggers present a pad that is struck using a conventional kick pedal from your acoustic kit. These setups vary in size and weight from large and heavy, to enormous and extremely heavy. So how can we get around this and still get the speed, feel and feedback that we are used to from our cam, springs, beater etc? A very basic and simple solution is Yamaha’s low priced KU100, but this was not present at the show, probably because user reviews never describe it as being an excellent choice. Roland have a more robust, and more expensive solution in the KT10. There were a few of these set up at NAMM and I was very impressed. They provided the feel of a decent real pedal and real bass drum in a footprint not much longer than a human foot. This is the ideal design route for people who want the smallest kits possible. No wastage of space. It could feel faster, but for the first in what is hopefully the wave of the future, it is great. Still using a regular kick pedal, but doing away with the beater, is the Triggera Krigg. This rubber pad is struck by the underside of the toe end of your normal pedal footplate. With practice, it can substitute for the conventional kick trigger, but of course, regular kick pedals are still pretty large. Most drummers already have a nice pedal, so this is an affordable tiny solution. Note that I did not see a Krigg at NAMM but I have owned one. The trend in todays giant electronic kits is to have a top Hi-Hat cymbal trigger that really goes up and down on a real acoustic hi-hat stand. All the high-end kits now include real Hi-Hat stands. I feel that this is a wasted opportunity. The cymbal is always situated above your foot, just as it was on Grandpa’s drum set. Not necessary. Assigning the hat to a pad or pads and having the pedal separately on the floor is more sensible unless you are stuck on the concept of positioning your e-kit as similarly as possible to your acoustic one. This is the key to taking full advantage of electronic drums. You don’t need sparkly drum shells, steel hardware that weighs more than a small person, fourteen inch heads, and all the rest of it. It is not your acoustic kit, and if you cannot adjust to playing things in more convenient places, you are not trying hard enough. If electronic drums embarrass you, no amount of pseudo-acoustic disguise will make you feel comfortable. But multipads have always disappointed. The pads have been too hard and noisy, like on the older Alesis multipads, or too soft for stick rolls, as on the Yamaha DTX-Multi-12. Or the sound memory has been filled up with electronic and world percussion voices that a drum set drummer has little business using. And in some cases, the control interface has been too unfriendly. It is understandable that the manufacturers want to develop and sell the same device to people who want to produce musical notes and tones with their sticks, or want to play the same device with their bare hands, but this destroys the focus of making an excellent specialized drumstick and drum set product. And so the quest for a new acceptable multipad product for 2016 begins. 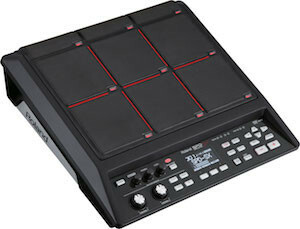 The Roland SPD-30 Octapad, Version 2. This device is a compact array of eight pads that have a reasonable feel, with a similar rebound,in my opinion, to an acoustic 14 inch tom. The onboard intelligence is geared towards playing short sequences (“phrase loops”), and world and electronic sounds, but there are also some good drum kit sounds accessible in custom user-assigned kits. 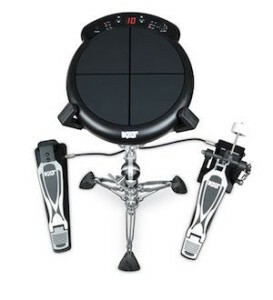 So it can be used as a standalone drum set, and you can add a kick trigger and a hat pedal. You can also add extra pad triggers, and my conclusion is, for this to be a really familiar solution to many drummers, an external snare pad should probably be plugged in, which might also make it easier to generate a decent buzz roll and free up one more of the Octapad’s eight native pads. 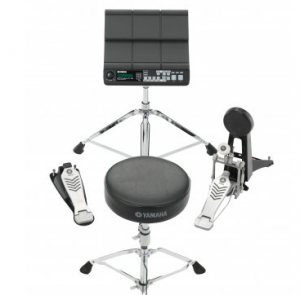 So for this to be a such kit, you would need a stand for the Octapad, a optional snare pad and stand, a hat pedal and a kick trigger, like a KT-10. A pricey rig, but still one of the best solutions for my goal using today’s products. If you are not so hung up on the snare pad, then just use the native eight plus your Roland pedal triggers. In the past I have based a small kit around the older SPD-20, but good onboard sounds were lacking on that older model. Roland also offer the SPD-SX, a very high quality and robust device with the best pad feel but this is not a plug and play standalone. There is no way to plug in a hat controller and just have a hi-hat on one pad. At the Roland exhibit, one employee said that is possible, and another confirmed it is not. The SPD-SX shines as a sampler and has beautifully playable rubber, and this just makes today’s situation all the more frustrating in terms of my quest. KAT’s KTMP1 multipad is extremely inexpensive, but has a hard rubber feel. With only four pads, it would struggle to be a really versatile compact drum set, unless you had two to four of them, which would still be cheap, but you would then need a mixer. The JamKAT by Alternate Mode is the MIDI interpretation of the visually similar iOS Jambé, and the JamKAT was set up at the Aquarian booth. It was not set up properly, probably because people had interfered with it’s complicated and delicate setup arrangement, which had a NAMM show kit selection interface hooked up to a Kurzweil and also a Yamaha sound module, via an interim interface called a DITI. The staff were waiting for Mario of Alternate Mode to get back and tweak it all. And that is a metaphor for any Alternate Mode product. They are fantastic products and terrible products all at the same time. There is nothing as wonderful as playing drums on a TrapKAT for example, but the user control interfaces seem to be from planet X. If you are not Mario DeCiutiis himself, there is always a control interface nightmare. So here is this JamKAT which oozes potential, as compact and portable as the top third of a snare drum, but it is hooked up to a flight case full of gear, more trouble than a massive drum set. And I had trouble wth a buzz roll. To add kick and hi-hat pedal input a kit based around a JamKAT does indeed require more equipment, much larger than the JamKAT itself. This being the Aquarian booth, showcasing the OnHEAD and InHEAD systems for electrifying an acoustic kit, the TrapKAT and DrumKAT were not there. I have owned three DrumKATs and a TrapKAT 5KS. The TrapKAT 4, paired with a nice sound module is still probably the best, reasonably compact, solution to electronic drumming, but it is still a beautiful product marred by a terrible control interface system, and other quirks such as mislabeled inputs and outputs, fragile power converters, etc. And this will never change or improve as long as Alternate Mode continue to resist a long overdue reimagining. Yamaha’s DTX-Multi 12 is one device that I once owned for a day and then returned it. This was years ago when they first became available. 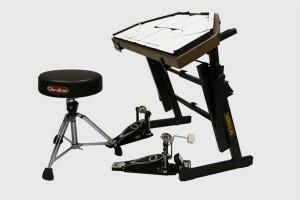 Designed for fingers, hands or sticks and with a focus on world sounds, it is not squarely aimed at someone looking for a compact one-piece drum set. When I played it with sticks there was little to no rebound. Any drum roll was no more than wishful thinking. And I had to set the sensitivity to fingers, to get any expression at all from the sticks. I chatted with Steven Fisher of Yamaha about it and he said it could be a decent compact kit if you added a snare pad. But I have to say, as much as I am a Yamaha fan, I would rather use a Roland Octapad as the centerpiece of such a setup. I play in a jazzy style, and this requires a nice bounce for my softer, faster strokes and lighter drumsticks. 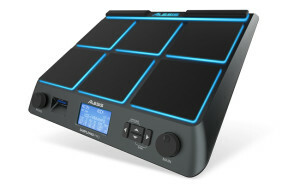 Over at Alesis, I played extensively with the SamplePad Pro. I quite liked it. 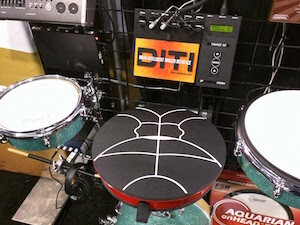 Quality and reliability is suspect, and on this, the fourth day of NAMM, there was already a dead pad on the top right. In a push, I could gig with one, but people are saying, and demonstrating, that pads die, and there is a crosstalk issue, where playing one pad sometimes triggers the adjacent pad. It is not a high quality item, and it really could have been with a bit more thought. It is close, but not good enough, due to economy of pricing. I get very upset when any gear malfunctions, and so far only Yamaha and Roland drum gear has been reliable enough for me. Everything I have tried that was not wearing a Yamaha or Roland logo, has malfunctioned, failed, or broken. 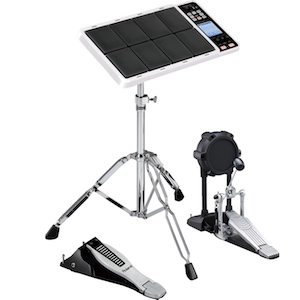 The Alesis Performance Pad Pro was not there, but I have to assume it will be no more robust. I have in the past owned older Alesis models, a Performance Pad and a Control Pad. Neither was a contender for my quest. So what will I get to replace my Yamaha DTX-700 drum set when I am living in a tiny house on an island? At this stage I still don’t know. I found no perfect solution and am left still waiting for something new. I would just get a practice pad and use my imagination, but I have to record music this year so I am going to have to get something that actually works! Writer Jeffrey the Barak is a drummer who needs to buy something that does not yet exist. Sometimes he laughs at nothing, which confuses people. Thanks Tad. I think the simplest, most basic DrumKAT, the DK10, is the best one, simply because it has less going on, but achieves the same goal. And the amazing TrapKAT is a dream to play. If only the entire control interface and display was completely replaced with something for drummers, rather than something for advanced engineers, they would be world leaders. Try out as much as you can in the stores, and then play on. Nice article, Jeff. I have a full report on NAMM’s edrum offerings coming out in a few days in the February digitalDrummer (wwww.digitaldrummermag.com). 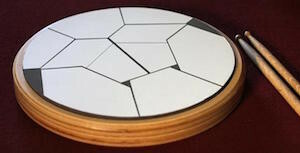 There’s also an article on a compact drumming solution! Waddabout Nord drum 2 + Nord pad? No hihat but really portable and powerful sound editing. It’s a percussion synth. Looking for something to augment, not replace, my kit. Primary use is writing/recording, but would be nice to be able to gig with it. Octapad? SPD-SX? SPD-SX is the best feeling one, as long as you don’t need to play it as a mini-kit with pedals. But it is not a similar item to the Octapad. They serve different functions.